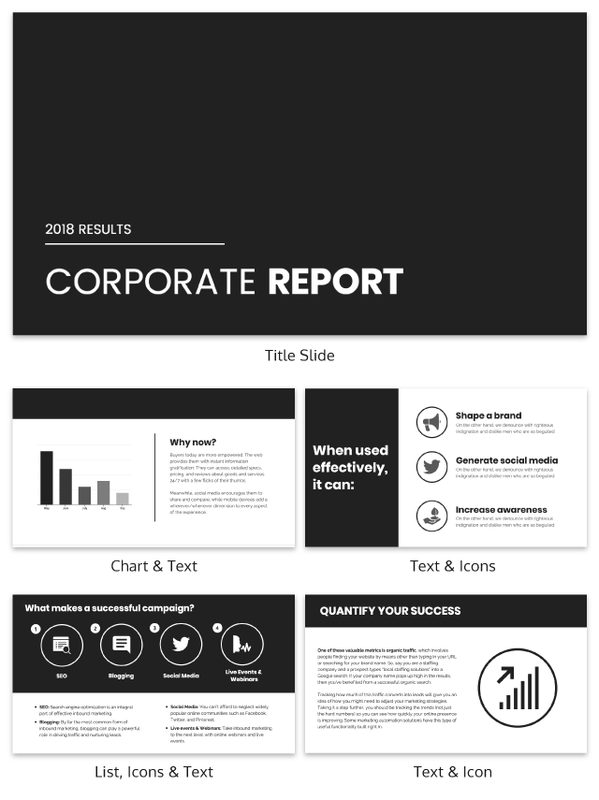 Start your presentation design with this simple business presentation template today! Corporate presentations are no longer stressful with this simple Dark Business Presentation! The template is easy to edit and great for sending the right message. You can customize the Dark Business Presentation template to be as basic as you want or more detailed. Each slide can be edited including the text, font, colors, icons, charts, or you can upload photos. Make the color scheme bold or subtle depending on how you want to approach your audience. The Dark Business Presentation template can work for any corporate office, company, or small business. Whether discussing a new marketing strategy or social media campaign, the Dark Business Presentation is the right choice!